Atlanta decided to be a flirt this week and gave us a brief taste of spring. One day was in the 70s--sunny skies! Ice cream! Flip flops! And today it's snowing! But that's fine with me because I've already gotten my house feeling all festive and flirty! I just needed pretty flowers, a flirtatious scent, and some new makeup. But since I'm on a spending ban, new makeup is out, so I decided to make my own. 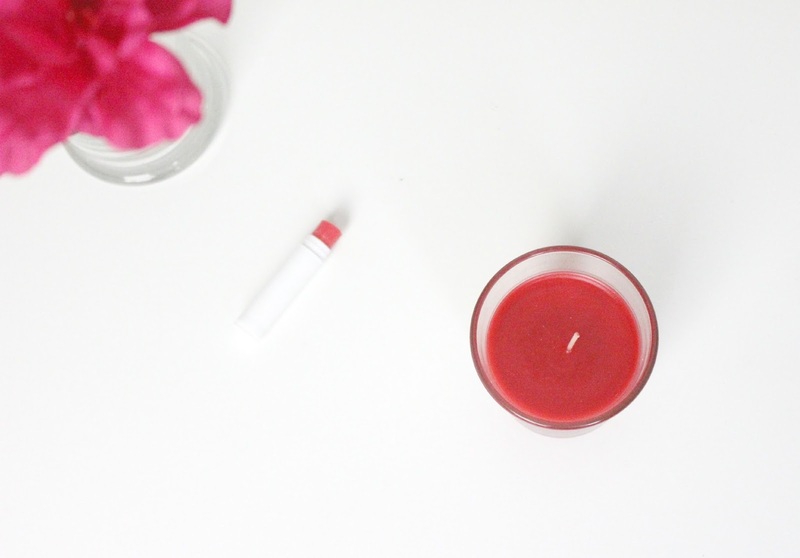 Here's my super fast and easy DIY Tinted Lip Balm. You gotta make those lips kissable, right? A tinted lip balm is moisturizing and delivers a slight tint to the lips. Perfect for those of us who desire a look that's natural, but still flirty. Now check your makeup bag. See that one lipstick you never use, that's at the bottom on the bag? That one that's just the wrong color? That's what you're going to use. Pick any lipstick you have--I am using one that melted a little in my car. It's a very bright red, not a shade I normally wear. The shade that just didn't work will transform into something you'll love once you melt it. Now you'll need a lip balm. I chose cherry. My choice for color and scent was influenced by the latest fragrances from Glade. I have the new Blooming Peony & Cherry™. I seriously have these all over my house. They smell so good! Think the scent of delicate peony and fresh pink roses meets the romance of cherry to flirt with your senses in the best way. 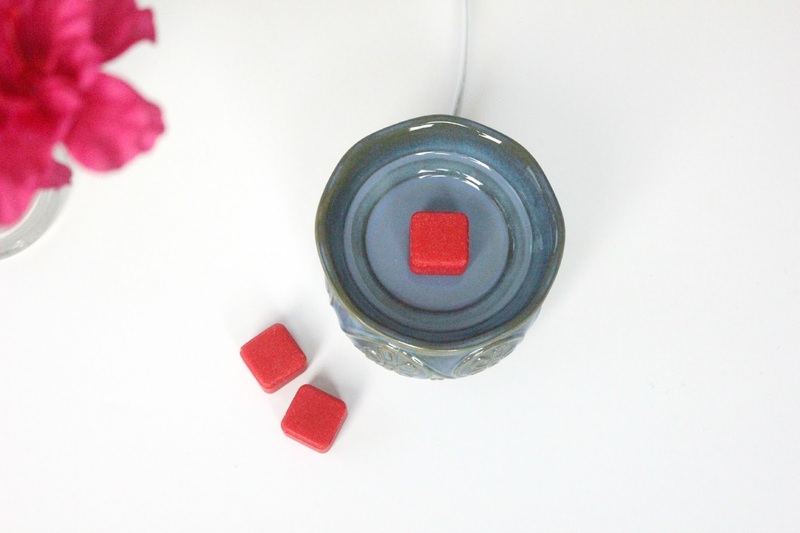 I've been LOVING the wax melts and jar candles from Glade. Now back to the tutorial! In a microwavable bowl, melt a little of your lipstick and then empty 1 tube of cherry lip balm in the microwave, as pictured above. 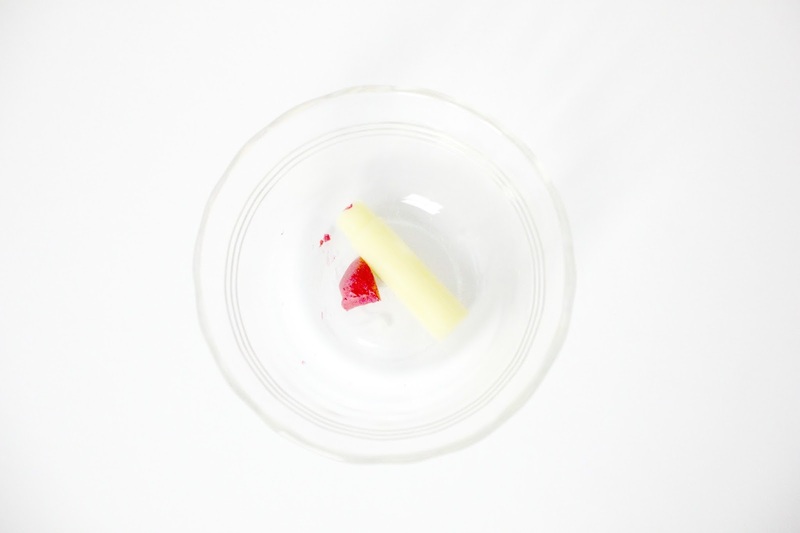 While it's all melting, be sure to twist your lip balm tube back down to the bottom so you can add the mixture back in. Once melted, stir and pour back into the empty lip balm tube. I use a small funnel to help. Allow to cool. I pop mine into the freezer while I clean up. And that's it! so neat I love your DIYs. What a great idea! 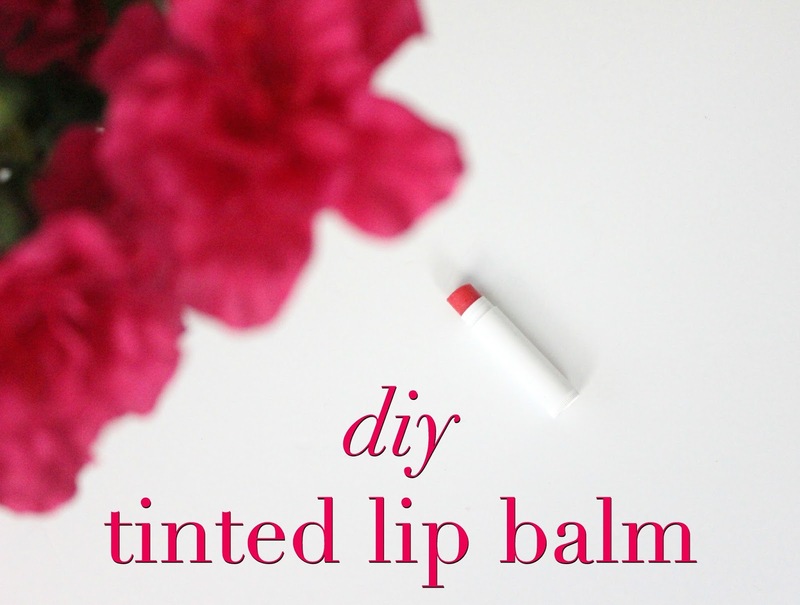 I had always wanted to try making a tinted lip balm but never thought about how to get it back in the tube. I don't know why I never thought of a funnel! What a gorgeous shade! I haven't bought a lip balm in so long but am really tempted to try this! This is such a great tutorial Elle! The weather here is crazy! I am sitting here watching the snow fall as I type and tomorrow is supposed to be sunny and in the mid 60's!!! Hope you have a great weekend! I love tinted balms. I have never thought to make my own. What a great idea! And so simple, too. What a great idea, Elle:) I have tons of these lipsticks I can make into a balm! How fun and easy! I love this idea! And I love tinted lip balm because I have such little pigment on my lips I always need a bit of color! I love those Glade Wax Melts as well - the Christmas scents are my favorite! Definitely attempting this beauty DIY - it looks so easy!! How easy is that! I love this DIY! So good that the weather was better! I also love Glade, by the way :) I love lip balms and with colors, and I have a friend who makes lip balms out of chocolate! and they are so god! I never tried to make makeup, but I may give it a try, athough I feel a bit too clumsy to do it! But it's a great tutorial and if I am not good on that, my friend will love it! I had no idea you could DIY something like this! Makes perfect sense, what a fun idea!! Quick and easy?! I like it! Def going to do this soon. This is really clever. I have to admit I thought it looked way too intricate but you broke it down really well. The smell of flirty flowers is a favorite! this seems too easy! I will definitely have to try this because I've got tons of lipsticks I never wear! I'm definitely more of a chapstick kinda girl. I love this DIY! Will definitely have to try it soon! This is so genius! I love a good DIY! This is such a good idea!! I love the combination of color and moisturizing! We actually JUST bought the peony and cherry Glad plug ins yesterday at Costco and so far they smell really good :) Have a great weekend! You should start a youtube channel doing instructions for all of your DIY products. I think it would do really well! We just purchased the Peony Blooming Cherry scent for our Sense and spray and I cannot wait to use it! Sort of want to yank the old Cashmere woods out early. (; I love Glade products. We've been dedicated buyers for years and as apartment life would have it, having kitties and a baby can make scents a little interesting. Glade is the only brand that, to me, actually smells. Maybe my sniffer is broken, but I cannot smell Airwick, or Febreze at all! You know I love a simple DIY, so this is right up my alley. I have to give this a try. I hope it works great for sensitive skin (yes even my lips can be sensitive). Love this!! Such a perfect idea Elle. 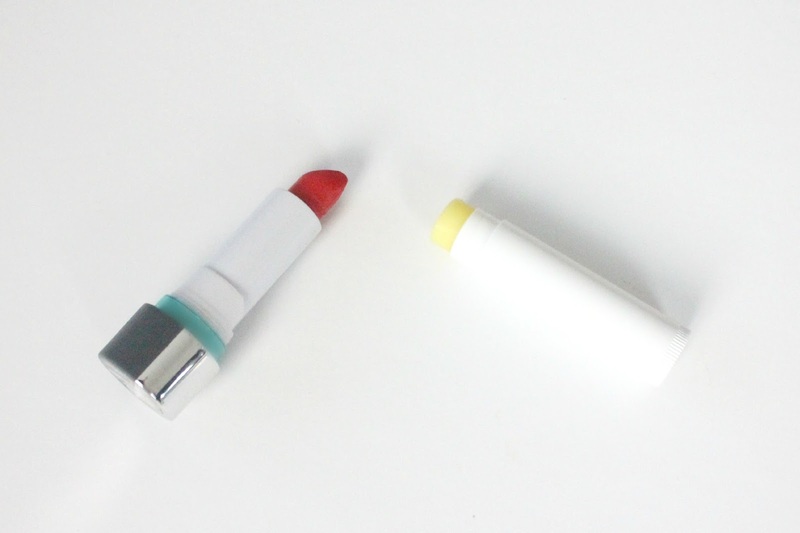 We're big fans of Fresh's tinted lip balms but we'll have to try this out for fun. This is a great diy! You chose a great color to turn into a balm. I really love the pictures you got! This looks incredible! What a great way to use an old lipstick! Now this is right up my alley! Thanks for the diy! I'm definitely pinning it to try out later! I have so many different lip balms and lip sticks that I should definitely try this. Also, yes, Wednesday was LOVELY. But Dan and I are enjoying this weekend, too. We ran our errands in his Miata with the top down, and tomorrow we're going on a picnic! I didn't know that Glade had wax melts. Dan and I bought one of those warmers a few months ago when our local (in Ohio) JoAnn's had a liquidation sale before moving locations. It's an owl and SO cute. I'll definitely have to see what sort of scents Glade has, although we have plenty for now. I love this idea! I definitely have some lipsticks that I don't wear lying around, so I could totally make this! wow! such a neat idea! i really want to try this. try it. If I don't have a microwave, do you think I could put the bowl over boiling water to melt? Love this! I never know what to do with leftoever lipstick! very informative and useful as well! thanks for sharing! I love cherry scented things. And that balm looks amazing! Great DIY post! I'm glad it's back to Spring in Atlanta! I didn't like the cold spell. This sounds great, I will have to try it out! Oh man this is a great tutorial!! I just have to try it!